Dog parks can be a lot of fun for dogs. They get a chance to run and play off-leash with other dogs. However, dog parks can be an accident waiting to happen if you're not careful. In addition, if you don't know the basic rules of going to the dog park, you can really ruin it for everyone else. Here's what you need to know before you bring your dog to the dog park. Don’t bring puppies under the age of 16 weeks (or puppies who have not been fully vaccinated). They can come into contact with diseases they don't have immunity against. In addition, they can be injured by bigger adult dogs and they can pick up some bad behaviors. Only bring healthy dogs to the dog park. Your dog should be fully vaccinated and free from any signs of illness or injury. You don't want to get the other dogs sick. Plus, your dog will only get worse if allowed to play freely. Contact your vet instead. Don’t bring aggressive dogs. 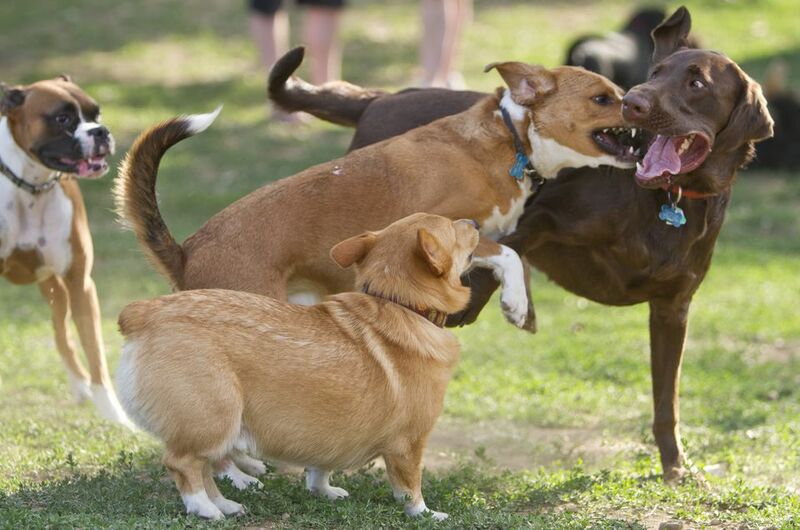 A dog park is no place for any dog with a history of aggression towards humans or other dogs. Find alternative ways to entertain and exercise your dog. Consider training or behavior modification. Never bring an intact female in heat to the dog park. There could be an intact male dog that cannot control himself! My guess is that you are not planning on breeding your female to some random dog park dog. Worse, if more than one intact male is in the park, they could start a fight over your female in heat. Don't risk this! Avoid bringing an intact male to the dog park. Statistics show that these dogs are more likely to become involved in aggressive situations (sometimes it's the other dog and not even the intact dog who starts something) Use extreme caution if you have an intact male, and make sure he is exceptionally well-trained and socialized. Better yet, spay or neuter your dog! Avoid bringing babies and small children to the dog park. Dogs can easily run into a small child when playing. They may get a little too curious about the baby or child you are holding. Also, remember that you don't know the other dogs in the park. A running child could set off another dog's prey drive, leading to disaster. You're better off letting another adult take the kids to the playground while your dog plays in the off-leash area. Another reason children don't need to be roaming around strange dogs (and possibly dog poop): some parasites are more harmful to children than to dogs! Is Your Dog Ready for the Dog Park? Before heading to the dog park, make sure you have a well-socialized dog. The dog park is not the place for your dog to become socialized. Ideal socialization happens in a controlled environment when you can be sure things will not turn bad. Any dog entering the dog park should already have a good foundation of socialization so they all know how to act around each other. Plus, an un-socialized dog may be impressionable and can pick up some pretty bad behaviors at the dog park. Be sure you have good verbal control of your dog before (good recall and other training). Your dog should have a good foundation of training and know basic obedience cues. It is essential that your dog has an excellent recall. An emergency recall is important as well. Most dog parks have rules posted outside the gate. Read them and follow them. This will benefit you, your dog, and others. Have a good look around the park before entering. Don’t bring your dog in if the park seems overcrowded or if there is already bullying or aggressive behavior happening. If it's an off-leash park, be sure to take your dog off the leash before entering. A leashed dog can feel vulnerable around loose dogs and may defensively lash out. Most dog parks have a double-gated area where you can let your dog off the leash before letting your dog into the dog park. If several dogs charge the gate as you are entering, wait until they clear before you let your dog in. Ask the other owners to call their dogs away if needed. If there is a separate area for smaller dogs, bring your small dog there. Don’t bring small dogs to the big dog area, nor big dogs to the small dog area. If there is no separate area, then use extra caution at the dog park. Watch to make sure the dogs playing are close enough in size that the smaller ones are not at risk. Pick up after your dog! No one wants to step in poop. Plus, some dogs like to eat or roll in other dogs' poop. Be courteous. Bring bags, pick up the poop, and dispose of it properly. No one wants to step in poop! Plus, some dogs like to eat or roll in other dogs' poop. Be courteous. Bring bags, pick up the poop, and dispose of it properly. Avoid bringing toys, especially if your dog has resource guarding issues. If so, keep your dog away from toys inside the dog park (or remove the toys). Supervise your dog at all times. I cannot stress this one enough! You are not at the dog park to socialize with other humans or to play on your smartphone/tablet/laptop. Watch your dog at all times. Be sure to call your dog away if things are not going well (bullying behavior, excessively rough play, aggression, etc.). It's time to leave the park if things get out of control or if your dog becomes tired or bored. It's important to know that if your dog injures another dog, it is your responsibility! Following the above guidelines will decrease the chances of problems, but accidents do happen. Be prepared to take responsibility if something does happen.